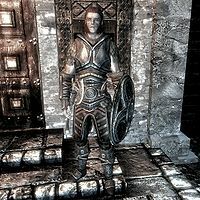 Housecarls are the personal bodyguards appointed to jarls and their thanes (if any) in Skyrim. Housecarls are free men and women who are voluntarily sworn to protect their masters with their own lives. Almost every jarl and thane in the province of Skyrim has their own personal housecarl that is often by their side. However, the housecarls of thanes are often found inside of that thane's home. Every housecarl that is appointed to you is also available as a follower, who, in turn, can carry out orders, carry equipment, and protect you from harm. A few housecarls in the employ of jarls double as the general of their army, and are thus involved in planning war strategies. In terms of court politics, housecarls are the equal of court wizards, but less important than stewards and, of course, the jarls. In summary, housecarls are faithful guardians who are very useful in both the royal courts of Skyrim and in the deepest depths of its ruins. "I'll guard you, and all you own, with my life." is primarily skilled in Heavy Armor and One-handed. reaches their maximum level at 50.
is willing to commit any crime you request of them. 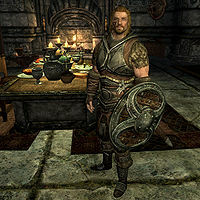 None of the housecarls appear in the game until you become a thane of their associated hold: Whiterun, Haafingar, The Rift, The Reach and Eastmarch in the original game (in each of which the player can buy a house in the major city), with The Pale, Hjaalmarch and Falkreath Hold in the Hearthfire add-on (in each of which the player can buy a plot of land to build a house in the country). There are no houses, plots of land or housecarls available in Winterhold. Housecarls stay in their own rooms of their corresponding houses, except for the three added by Hearthfire, who patrol around the plot of land the player has purchased. If the corresponding house for these three does not have an available bed to sleep in, they will go to a different player-built home (if one has a bed available) for the night, then spend the next morning walking back. 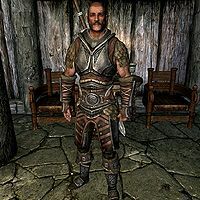 Argis the Bulwark is a Nord warrior living and working at Vlindrel Hall in Markarth. Once you have purchased the home and attained the rank of Thane of the Reach, Argis is appointed as your personal housecarl. As such, he is not accessible until Vlindrel Hall has been purchased. For more information, see Argis the Bulwark's main article. Calder is a Nord warrior from Windhelm. Once you have purchased the home in Windhelm, Hjerim, and attained the rank of Thane of Windhelm, Calder is appointed as your housecarl and will automatically appear in Hjerim. For more information on Calder, see his main article. Gregor is a Nord warrior found in the White Hall in Dawnstar. He becomes your personal housecarl when you have earned the title of Thane of the Pale if Hearthfire is installed. For more information on Gregor, see his main article. 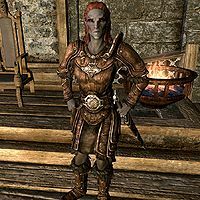 Iona is a Nord housecarl who is assigned to you when you become Thane of the Rift. Once assigned, she will take residence in your Riften home, Honeyside. For more information on Iona, see her main article. Jordis the Sword-Maiden is a housecarl assigned to you upon becoming Thane of Haafingar. Once you become Thane, Jordis will take up residence in your Solitude home, Proudspire Manor. For more information on Jordis, see her main article. 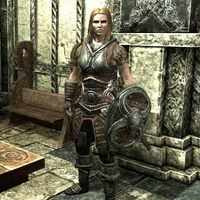 Lydia is a female Nord living in Whiterun. 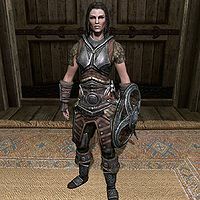 She is likely to be your first housecarl, as she becomes housecarl after you are titled Thane of Whiterun upon completion of the Dragon Rising quest. If she is not following you, she resides in the main hall of Dragonsreach, although if you purchase Breezehome, she will move there. For more information on Lydia, see her main article. 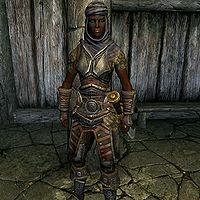 Rayya is a Redguard warrior found in the Jarl's Longhouse in Falkreath. 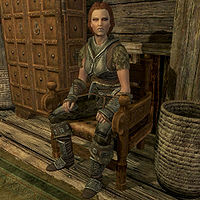 She becomes your personal housecarl when you have earned the title of Thane of Falkreath Hold if Hearthfire is installed. For more information on Rayya, see her main article. Valdimar is a Nord sorcerer found in Highmoon Hall in Morthal. He becomes your personal housecarl when you have earned the title of Thane of Hjaalmarch if Hearthfire is installed. For more information on Valdimar, see his main article. 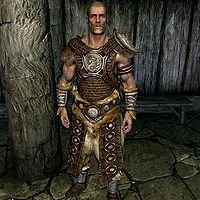 Besides your personal housecarls, the jarls of Skyrim are also served by housecarls, who serve them as military advisors, generals, and personal bodyguards, although their exact function seems to vary from hold to hold (e.g., the housecarls of Winterhold seem to function more like generic courtiers than bodyguards). *Helvard is the target of a Dark Brotherhood assassination contract, and will not be replaced upon his death, although game data indicates Zaria or Thadgeir may have been intended to. †The dialogue quest for Morthal indicates that Idgrod the Younger is her mother's housecarl, but Gorm is functionally the housecarl, and identified as such by other game data. ††Irileth will return from exile if Olfina dies.